A Junk-Foodaholic's Journey to a Healthy Lifestyle: Adina Stewart Lost Over 120 Pounds! 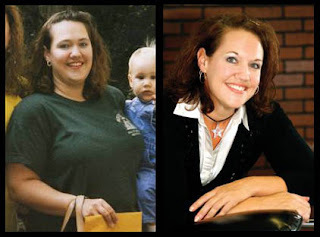 Adina Stewart Lost Over 120 Pounds! Two years ago, Adina Stewart was morbidly obese. At 5’5”, Adina, mother of two, was a size 26 and weighed 256 lbs. Now, weighing in at a svelte 135 pounds, Adina says, "Anyone can lose weight if they have the want to, willpower and ability to take it one day at a time." At 10 years old, an age when most children enjoy a carefree, breezy youth, Adina Stewart recalls worrying about her growing body size, anxiously wondering if she was more than 20 pounds heavier than her best friend. Nervous that she differed from her peers, Adina never felt comfortable among them. “My dad had left our family the summer before, and that summer marked the beginning of my weight problems.” Distraught and concerned, Adina began gorging on food to emotionally cope with her family’s issues — a handicap that escalated, leading her to tip the scales at 150 pounds at age 12. Adina filled the void of her father’s departure by sneaking food — hiding her compulsive eating habits from the rest of her family. Adina showed little or no restraint when it came to meals. With no self-control, she ate disproportionately large amounts of food to either celebrate the good times or indulge herself during more trying ones. Adina knew that she had to kick-start the new family line, one of healthy individuals with good eating habits. It wasn’t enough to preach; if she wanted to affect her sons, she would need to completely transform her lifestyle and embrace diet and exercise. Adina tried various methods to lose the weight and keep it off. A longtime admirer of runners’ ultra-lean bodies, Adina took up jogging and after a year, without making any changes to her diet, she lost 27 pounds. “I realized at some point I would have to make a plan. I actually started to be less careful with what I was eating, because I knew the jogging would keep me from gaining,” she said. Since she knew she lacked discipline, Adina decided to put her meals into someone else’s hands: NutriSystem. For the next two months, she refused to eat anything that wasn’t part of her NutriSystem plan (although she made exceptions for her favorite treat — sugar-free Jell-O). After noticing the dramatic results, Adina decided to take her weight-loss commitment one step further — she joined a gym. Apprehensive at first about how she would fare, she soon made the gym her second home. The constant encouragement from staff and the camaraderie of fellow dieters helped her thrive during plateaus and challenging times. Another great source of motivation for Adina was allowing her two sons to look at the scale each time she stepped foot on it. "I know that if I hadn't allowed them to actually watch me lose weight and keep track of the pounds I wouldn't have been as successful," she said. "I didn't want them to see Mom's weight increasing, and I didn't want them to see Mom eat unhealthy foods. I wanted to be a good role model for them both. While Adina felt more comfortable with her size, she still wasn’t exactly where she wanted to be. She had mastered exercise, but was doubtful about whether she had the right daily food intake. A few months after joining the gym, she contacted the makers of Oh Yeah! Bars to tell them how much she enjoyed their products. She ended up striking up a friendship with a representative who, after glancing at a list of her daily intake, informed her that her body was overworked and underfed. That advice, combined with running and encouragement from her gym staff, helped Adina lose 121 pounds. She now weighs in at just 135. It's been a two-year process, and, although Adina said she's never looked or felt better, she admits the weight-loss process has been anything but a piece of cake. "It's hard at first, but I knew I was so big I couldn't lose weight overnight," she said. "No one can overeat for all their life and expect to drop that weight in a couple of months." "As you start eating healthy and the pounds begin to drop, you'll realize that you're no longer eating healthy because you HAVE to – you do it because you want to and because it feels better than putting junk in your body," Adina said. "I used to hate it when people would talk about dieting as a change in your lifestyle. But it's true, and it's a wonderful change." After decades of struggling with a lack of self-control and humiliation over her body, Adina is now finally content with her size and diet. Food is simply fuel for her body today; it no longer controls her thoughts or actions. Adina feels that many more opportunities are available to her since she shed the weight. She now does public speaking about weight loss, helps struggling dieters at her gym, and feels more confident about achieving her aspirations. More important, Adina feels like she can finally blend in with the crowd instead of sticking out because of her size. Check out this video from NBC's Today Show. Pam Davis Lost 279 Pounds! Salute you Adina Stewart. You just lost another me.. I wish I have that willpower to reach my target. I just need to shred down 11 lbs to my target weight of 110lbs. She has a very inspirational story and my life mirrors so much of hers...after 4 years of fighting chronic pain, I am now trying hard to take control of my eating and exercise to lose weight and maybe reverse the type II diabetes. I also want to teach my children healthier habits than their father and I have. Hey Sassy Mama Bear! I agree, it is a very inspirational story. It always encourages me when I see someone achieve such an incredible goal. I know it's tough but you can do the same thing (I'm talking to me too). Keep at it and you'll get there... one day at a time.